YOUR EQUIPMENT AND THE ENVIRONMENT Lubriplate’s environmentally responsible lubricants have been formulated to help reduce their impact on our environment without sacrificing lubricant performance. Their use can also help our customers comply with the ever increasing environmental regulations for equipment operating in environmentally sensitive areas. ATB BIOBASED EP-2 GREASE • An ECO-Friendly, NLGI #2, Multi-Purpose Grease for use on All Types of Equipment Operating in Environmentally Sensitive Areas. • Excellent For Marine Applications including Articulated Tug Barge (ATB) Notch Interface, Coupler Ram and Drive Screws, Above Deck Equipment, Rudder Shafts, Cables, Port Equipment, Cranes, Barges and Oil Platforms. • Meets U.S. EPA Vessel General Permit (VGP) Requirements. • Passes U.S. EPA Static Sheen Test 1617. • Passes U.S. EPA Acute Toxicity Test LC-50. • Ultimately Biodegradable (Pw1) Base Fluid – 75.2%. BIO-SYNXTREME HF SERIES HYDRAULIC FLUIDS • ECO-Friendly Hydraulic Fluids formulated for use in All Types of Equipment Operating in Environmentally Sensitive Locations. • Meets U.S. EPA Vessel General Permit (VGP) Requirements. • Advanced synthetic Polyalkylene Glycol (PAG)-based formulas. • Provides long service life and operating reliability, lower maintenance costs, and reduced overall downtime. • Excellent Anti-Wear Performance - Rated as anti-wear (AW) fluids according to ASTM D7043 testing and FZG testing. • • All Season Performance – High viscosity indices and low pour points, allowing year-round usage. • Biodegradability – Readily biodegradable according to OECD 301F. • Non-Sheening – Does not cause a sheen or discoloration on the surface of the water or adjoining shorelines. • “Practically Non-Toxic” to fish and other aquatic wildlife according to the U.S. Fish and Wildlife Service hazard classification. High quality, aesthetically pleasing, functional products that set the trend. Vaal has a product for every taste. A selection of high quality sanitary grade cast acrylic baths, that will meet the demands of most individuals. The editor accepts letters and manuscripts for publication from readers all over the world. Include your name and address as a sign of good faith although you may request your name to be withheld from publication. We reserve the right to edit any material submitted . 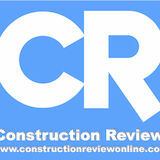 Send your letters to: info@constructionreviewonline.com Construction Review is published eleven times a year and is circulated to members of relevant associations, governmental bodies and other personnel in the building and construction industry as well as suppliers of equipment, materials and services in Africa, the Middle and Far East. The editor welcomes articles and photographs for consideration. Material may not be reproduced without prior permission from the publisher. The publisher does not accept responsibility for the accuracy or authenticity of advertisements or contributions contained in the journal. Views expressed by contributors are not necessarily those of the publisher. ÂŠ All rights reserved. 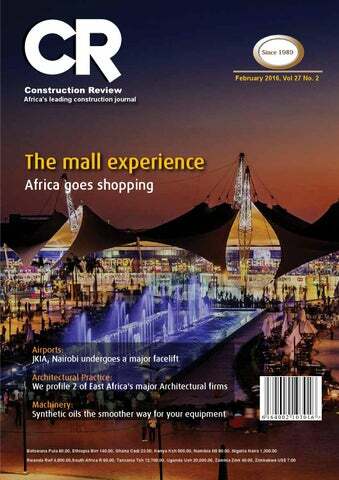 Cover Picture The cover picture shows the dancing fountain at the Mall of Arabia in Egypt which is the largest mall in Africa measuring 2.87million square feet of retail space. Events 13 Guest: 14 Michel Dib Hanna Group - GM, Speed House Group, AJMAN, UAE looks at current and future trends in the prefabrication and modular building industry Lubricants	22 Why turn to synthetic oils for your engine lubrication? one of the leading architectural practices in Sub-Sahara Africa. Airports	34 A new terminal 1A arrivals and an international arrivals terminal (Terminal 1E) are currently being constructed at JKIA, Nairobi. Cement	44 Bamburi Cement, Innovation at its best! South Africa Office College Publishers CC 1st Floor, 267 Oak Avenue, Oakfields, Randburg, Johannesburg Tel: +27 11 781 4253 Fax: +27 11 781 4287 Email: southafrica@groupafricapublishing.com Ethiopia Office Haymi Advertising Services 22 Mazoria, Genet Bldg 4th Flr P.O. Box 1316 - 1110 Addis Ababa Tel: +251 118 955 855, Cell: +251 930 099 152 Email: ethiopia@groupafricapublishing.com Ghana Office Image Consortium 1st Floor, TheEcobank Building, Tesano. As Africa’s middle class continues to grow no one can deny the fact that their taste for the good life is growing and fueling the demand for a richer and more diverse living experience. Electronics to brand name clothing and accessories to fine dining and all things imported are beginning to surpass the more basicexpectations of life. 90 percent of Africa’s population is below 45 and half of those are below 15 which means that the future is bright as far as new, impressionable shoppers is concerned. In addition to this only 30 percent of Africa do their shopping in malls and when this is compared to South Africa where the average is 60 percent the scope for growth is clearly evident. This fact has not been lost on global retailers and many are increasing their presence in Africa in a bid to ensure they have a place in this growing market. The result has been a demand for A-grade retail space in Africa’s major capital cities and satellite towns. The trend has also moved from simple shopping centres to large malls that offer a broad range of shopping and entertainment that is slowly edging out the smaller mom and pop stores. As the competition to attract foot traffic to new malls has increased, developers are moving towards constructing ever larger establishments covering over 50, 000 square metresinitially that offer eating, shopping, entertainment and living experiences with some promising to phase construction over time to reach mega mall proportions of over 100,000 square metres of retail space.The construction industry is busy providing for this new phenomena and when you look around there remains a huge scope for development across Africa as the malls effect moves from South Africa and Egypt to other countries in eastern, central and western Africa. makes Kenyans wonder what happened. We are confident that the Power Afrika initiative will help us realise our pledge to Kenyans,” said newly appointed Energy Cabinet Secretary Alfred Keter. repairs of the power units. region. Henceforth, as a regional project, the electricity generated will also feed into the East African Power Pool (EAPP). “At least US$139m will be borne by the AfDB’s public sector window and US$50m by the private sector window,” said a statement from AfDB. Implementation of the project will be carried out at a total cost of US$ 625m. Ghana’s Tema Port expansion project is expected to kick off any time this year, Marketing and Public Relations Manager Paul Asare Ansah, has announced. The US$1.5bn project will start off with phase I which will take about 3 years to complete. Upon completion, the port will handle thrice its current traffic of about one million Twentyfoot Equivalent Units (TEUs). He further revealed that the construction will expand the capacity of the port to handle even 3.5 million TEUs, far in excess of the projections that have been made. In June 2015, the Meridian Ports Services and the Ghana Ports and Harbours Authority (GPHA) signed a US$1.5bn to boost the efficiency of the port and make it more competitive. Since its first construction in 1962, Tema Port has had a 1.4km quay for 4 container berths with 16m draft and a 3.85km breakwater within a dredged port access channel, 19m deep and 250m wide to accommodate larger vessels. The project will also include a railway terminal for the movement of containers by rail to and from the port. The Accra-Tema Motorway will as well be expanded into a six-lane expressway with service lanes on either side to accommodate the traffic that will come along with the Ghana’s Tema Port expansion. Seven bids were opened by the GPHA, a couple of years ago from corporate entities and joint-venture companies, including a Ghanaian company, which expressed its interest to partner the GPHA for the Port expansion. documents will not be compensated. Construction of top notch expressway launched Ethiopian Roads Authority has begun the construction of what it says will be a major expressway which, upon completion in five years, will help ease traffic that has been forecast for the next 21 years. The country says in 21 years time the population would have increased significantly and that there was need to boost roads in urban areas. The construction of an expressway in Ethiopia has been in the pipeline for years. The Modjo-Hawassa Expressway in Ethiopia will have a million new trees flanking it on both sides. Prime Minister Hailemraim Desalegn has already presided over the official launch of construction of the first four phases from Modjo to Meki, The entire project is estimated to cost US$700m. China Railway Engineering Corporation was awarded the contract to construct the expressway. CREC was the largest construction company in the world in 2012, according to 2014 data compiled by Fortune Global 500. The African Development Bank (AfDB) will also help in financing the project. Techniplan International Consulting, an Italian Engineering firm, designed the full length of the expressway and reviewed by EthioInfra Engineering Plc, a local company. "The combination of slides, rides, and dancing fountains is a recent phenomena that has been developed at, so far, fewer than 20 children's playgrounds worldwide, but has been shown to be a source of huge entertainment and children's delight," said Alec Davis, CEO of Davis & ShirtliffEast Africa's leading supplier of water and energy equipment. The new fountain water play park is part of a three acre site at the Garden City Mall with play areas for children. The water spurts in an orchestrated sequence erupting at different heights, seeing children chase across the area as the pop-out jets shoot higher and higher before it all goes momentarily quiet, and then the fountains begin to bubble over again. “Thewater park area has also been equipped with state of the art water toys, water jets, cascade water features and a water play area with soft flooring to prevent kids from slipping and getting injuries,” said Davis & Shirtliff Pools Manager Stephen Muhia. The water from the park is circulated througha Dayliff water treatment system to the water jets, which fire the water through various nozzles into the air and it is then collected and send back to the pump room, where it is filtered, treated and pumped afresh to the water play area. have projected the population to exceed 120 million by the year 2050.
estate development, domestic engineering, trade and labor services. Kwikspace Modular Buildings is boosting affordable housing in Mozambique after heavy rains and major flooding left areas of Mozambique in a devastated state last year. Major infrastructure such as roads, bridges and rail networks were damaged. In addition, significant damage to the powerline leading to a well-known minerals mine occurred, leaving it in a situation where it had to rely on diesel generators and product inventory to counteract the negative effect of the resultant power cuts. Now, as the repair of infrastructure is carried out, South African-based company, Kwikspace Modular Buildings (Kwikspace), who further has two factories and a strong presence in Mozambique, has played a supporting role to the progress of this project, through the provision of prefabricated buildings ordered by Conco. A company responsible for electrical power distribution system construction, Conco required four prefabricated units for various purposes at a remote location on the mine site, where it is contracted to install new overhead power towers. Comments Nick Alexander, Director of Business Development for Kwikspace Modular Buildings in Africa: “The conditions were tough; bridges we needed to cross had been washed away and roads were impassable." Orascom Construction Limited is now set to construct two power plants in Egypt after signing contracts to convert two power plants, in Assiut and West Damietta, from simple cycle to combined cycle. According to the reports from the Ministry of Electricity Orascom Construction stands to earn a reported $420m in the deal. The spokesperson of the Ministry of Electricity Mohamed El-Yamani stated that OC’s contract is with the Egyptian Armed Forces and will be carried out by the company. The contract will see an increase of power production by about 505 to reach 2250MW as currently Assiut power plant produces 100MW while West Damietta’s capacity factor is 500 MW. This comes barely after the Ministry of Electricity launched its long term plan to increase the power production in the country. Orascom Manager of Investors Relations Hesham El-Halaby said the construction of the plants began in mid-December 2014 and was finalised in the third quarter of 2015. The company said: “both plants will be completed on an EPC [engineering, procurement and Construction] + Finance basis whereby OC helps arrange a competitive financing package. Martin Littlemore, Biwater Regional Manager, pictured with representatives of Camwater post-signing. Leading steel manufacturer in Ghana has announced that it was undergoing what it said is ‘a historic restructuring’ aimed at ensuring that the firm stays ahead amid stiff competition. The Western Steel and Forging Limited, the first indigenous steel manufacturer in Ghana, is currently undertaking a major restructuring. The new strategic vision is meant to transform and modernize its operations. According to Mr. Bhupen Achavya, the General Manager, Operations and Projects, the company is being overhauled in line with the changing trends and to meet the international standards. Mr. Achavya further revealed that various heavy machines have already been shipped into the country such as Continuous Casting Machines (CCMs). Women engineers in Kenya have been challenged to embrace technology and innovation instead of striving to compete with their male counterparts. Speaking during an event organized by the Institution of Engineers of Kenya (IEK) women chapter in Nairobi to sensitize women engineers on their role, Chairperson Eng. Rosemary Kung’u said women in the profession should be creative and at ease in adopting technology to boost their skills. “As women engineers we should be in the forefront in regards to using computer aided engineering software in a bid to stay relevant in the current fast changing world,” She said. urging women engineers to register massively as members of the Institution of Women Engineers, Eng. Kung’u said their strength relied on their numbers. “Together we stand divided we fall,” she cautioned. She urged women engineers from all over the country to come out and enjoy their profession despite all the responsibilities that surrounds them especially at family level. The event sponsored by the Kenya Roads Board and Safaricom Foundation was aimed at gauging the level of awareness on the current technology trends among women engineers in Kenya. African Road Maintenance Funds Association has appointed a new term. National Road Fund Agency chief executive officer Anthony Mwanaumo handed over the presidency to Ethiopian Road Fund manager Rashid Mohammed who was elected unopposed during the annual general meeting that took place in the Democratic Republic of Congo (DRC) capital city. Joining Mr Mohammed in the new executive are Mr Siandou Fofana, the director-general of the Ivory Coast as first vice-president who replaces Fulgeny Bamaros Lobota of the DRC and Atanga Bikote, the chief executive officer of the Cameroon Road Fund as second vice-president. Until their election Mr Mohammed was focal group chairperson for East Africa, Mr Siandou was the focal group chairperson for West Africa. Julius Juma from Zimbabwe who is chairperson of the Southern African focal group was elected auditor, taking over from Franklin Awuku of Ghana. Egypt's EFCBC to partner with Moroccan contracting firms Egyptian Federation for Construction and Building Contractors (EFCBC) is now set to partner with other specialized construction firms from Morocco so that they can push the growing sector in the two countries. Speaking during a special meeting with Morocco’s Minister of Housing and Urban Policy, Nabil Benabdallah EFCBC Chairman Hassan Abdel Aziz said they are looking into strengthening the current relationship the two countries are having and that will be simply achieved through the bilateral cooperation that the two countries will agree on. The chairman added that the Egyptian entrepreneurs are in to see that they establish long lasting partnerships between construction companies in Egypt and Morocco, in order to implement large projects in Africa. Africa’s construction industry is on the rise and partnership between the countries in Africa is a key step to ensure that we support each other since the African market is promising and has a lot of job opportunities into which a powerful Egyptian-Moroccan partnership could enter instead of foreign firms,” added Hassan Abdel Aziz. The Moroccan partner Benabdallah stressed the importance of deepening the partnership between Egyptian and Moroccan firms, adding that the partnerships will help both countries’ companies get international projects. and vocational institutions to generating the right mix of skilled manpower to execute the different programmes and projects under NIIMP. Putzmeister America, Inc. (Putzmeister) has announced updates to its BSA 2109 and 2110 Trailer-Mounted Concrete Pumps that will improve easeof-use and allow increased parts commonality among other Putzmeister products. The new generation pumps now feature a one-piece of C-frame, instead of two, in order to increase the ground clearance. Its supporting legs are bolted, instead of welded, to allow quick and easy parts replacement. Previously, the steel and the new aluminum hydraulic suction filter matches the BSF line, which results in increased parts compatibility. However, the filler neck for the diesel tank on both the BSA 2109 and 2110 models has been moved to allow easy access. The manual lube pump is now mounted on the hopper itself, for convenient operation. The two machines have also received new paintwork to align with the look of Putzmeister’s Thom-Katt® Trailer Pumps. According to Rico Heinz, Putzmeister Director of Engineering, the improvements are aimed at helping to make the operation and service of the pumps as easy as possible for the users. He further added that, the changes bring the company one step closer to its goal of reengineering the complete large line trailer pump product line to fulfill the Tier4 final emission standard. powder coating specifically developed for the unique architectural demands during the Big 5 International Building and Construction Show, in Dubai, UAE. The product comes with a wide range of design and colour choices for architects, contractors, engineers, and property owners. Besides the launching of the Safaa powder coating, the company has as well unveiled a new software for the optimization of estimated time of completion and structural calculation, The new solution will help in reducing production and estimation time by 50% as well as preparing structural and u-value calculations. However, the software will as well showcase solutions that meet and even exceed performance criteria for fire safety and acoustics in building envelopes, while noise reduction is an increasing priority for buildings, fire safety solutions ensure a safer built environment. The company also conducts Professional Development (CPD)-certified workshop on ‘Fire Safety in Facades’, as well as organizing a live demonstration of the best practices in façade installation, accessory and firefighting equipment during its participation at the show. Date: 22-284 February 2016 Venue: Dubai, UAE Website:www.kwppp.com. The 5th PPPs in Emerging Markets Summit will be hosted on 22-24 February 2016 in Dubai, UAE and July in Bangkok, Thailand. The Theme: ‘Moving from theory to practice to achieve infrastructure goals’ – The conference series gives access to emerging markets from across Africa, Americas, Asia Pacific, Europe & the Middle East for a programme of capacity building and networking with Project Finance leaders across government agencies, investors, project sponsors, EPC’s and consultants. The programmes are interactive and based around panel discussions with Case Studies sharing expertise from global thought leaders. To date the PPPs in Emerging Markets Summit series has hosted over 700 Government participants allowing access to capacity building, sharing of expertise and investment directly to emerging markets, to register visit the official website: www.kwppp. com. Date: 10th May 2016 Venue: Gallagher Estate, Jo'burg, South Africa Contact: christine.barrow@ access-africa.org Website: www.access-africa.org Access Africa is an exclusive platform focused on providing essential information on the investment climate and opportunities in key economic sectors across Africa. Access Africa specializes in bridging the gap for governments, investors and industry players in Africa’s key economic growth sectors. The Captains of Construction projects builds on the foundation that has been laid at the first annual event and publication in 2015. The project is two-fold, comprising the Captains of Construction Leadership Forum and the Captains of Construction Leader’s Book. ichel D Hanna, an MBA from Cass Business School, UK joined SPEED HOUSE GROUP, UAE in 2005. He has been working with clients and innovating client centric sales and marketing strategies ever since. Construction Review recently interviewed him on current and future trends inthe prefabrication and modular building industry: CR: How have construction projects evolved with the inclusion of prefabrication construction modules over the last two years? MDH: The concept of off-site construction followed by on-site installation is very popular as it offers temporary as well as permanent solutions alike. This concept has rapidly evolved because of its dynamism and versatile applications. The prefab concept is so dynamic that it caters to the needs of Oil & Gas, Power & Energy sectors on the one hand and Real Estate and Health Care Sectors on the other, just to name a few. The advantages of factory fabrication and regular quality inspection by well-trained professionals are some of the top reasons that has given a fillip to its evolution. Yes, it is true that architects and society in generalhave in the past viewed prefabricated buildings as insignificant structures. However, what has been noticed in the last 2-3 years is that architects are experimenting with modern designs and technical specifications in line with changing business scenarios. As there is a huge discussion about climate change taking place in every nook and corner across the globe, prefab industries have come up with green materials for eco-friendly finishes. The prefabricated buildings are much more flexible and user friendly because they can be customized as per requirements. You will be surprised to know that McDonaldâ&#x20AC;&#x2122;s the hamburger franchise started use prefabricated units as outlets which remain open for 13 hours a day at a stretch. The days are upon us to see the prefab concept entering all the industries cutting across their industrial profiles and requirements. clothes, home appliances and groceries. spurring a demand for quality retail space. increase in size over time. exerted on developers to build ever larger and more exciting establishments in order to attract global brand names. It has become all about size and attractions and so incorporating amusement parks of one sort or another is par for the course along with boasting some kind of green star rating for use of renewable energy and recycling water. Davis & Shirtliff is the regionâ&#x20AC;&#x2122;s largest water & energy equipment supplier with an unmatched product range, a wide network of branches and stockists, extensive stocks, full service support and ISO 9001:2008 certification. Contact the Professionals for the best water and energy management solutions available! The Future of Building Automation among BAS manufacturers, leaving relatively few independent players (such as KMC Controls). Why turn to synthetic oils for your engine lubrication? ubrication of moving parts in construction equipment relies on the knowledge and expertise of the operator or the maintenance team this is because without proper application of lubricants in the engine it would probably seize up and the inconvenience of downtime would become a reality.In Africa virtually all plant and equipment used in construction is subjected to extreme working environments in which dust, water and high temperatures are more the rule than the exception. This makes proper maintenance and care of the equipment all the more critical if you are to enjoy lower down time and increase the lifespan of the equipment. Replacement cost of equipment is high and so the savings to be obtained by postponing this event by ensuring proper maintenance cannot be casually overlooked. A proper oil and lubrication system for construction equipment is one of the sure fire ways to ensure that the machinery will run efficiently and this translates into savings in fuel consumption as well as maintenance costs, however even here using the right oil and lubricants can make the difference between extended useful life or a problematic working life for your machinery. Now that we agree that the right oils can provide substantial savings for plant operators then the first place to start when getting serious about your oils is to debunk the long held belief that all oils are made the same and work the same way no matter the manufacturer. This is because recent developments in the oil and lubricants industry has seen the emergence of specialised oils that are far more superior than conventional oils in ensuring your equipment remains well lubricated at all times. he new energy efficient Agrivaal building in Pretoria’s Tshwane Central Business District is using advanced natural ventilation and smoke control solutions from SE Controls Africa to maintain a comfortable indoor environment while improving safety by ensuring escape routes are smoke-free in the event of a fire. Designed by PKA Architects for the National Department of Public Works (DPW), the new 10-storey office blockintegrates with the original 75 year old Agrivaal building, a site of national heritage importance, with the final structure providing 21,650 square metres of rentable space, as well as a restaurant, coffee shops and545 underground car parking spaces. The new building incorporates a range of energy saving technologies as part of its design and construction, including recycled materials, water harvesting, energy efficient lighting and the use of natural ventilation, which enabled it to achieve a prestigious 4 Green Star rating from the Green Building Council of South Africa. SE Controls worked closely with the project’s fire and engineering consultants WSP Consulting Engineers from the initial concept stage, as well as ventilation contractors, Robertson Ventilation Industries, to develop the combined high level smoke and natural ventilation solution for the building. The system incorporates an NVLogiQ carbon dioxide sensor and environmental monitor fornatural ventilation, as well as a SHEVTEC smoke control panel and 10 SECO N 24 40 chain actuators, which automatically open and close the centre pivot windows in the atrium to vent stale air or smoke from the building. In normal operation, NVLogiQ sensor monitors the temperature, carbon dioxide levels and relative humidity and signals the actuators to incrementally open or close the windows, if the parameters go beyond preset points. In the event of a fire, the SHEVTEC control panel takes a signal from the building’s fire and smoke alarm system, which overrides the natural ventilation system and triggers the actuators to fully open the window to vent smoke from the building. Further information on SE Controls’ products, solutions and projects can be obtained by visiting www.secontrols. co.za or calling +27 31 466 1857. IS Y OU R S M OK E V E NT I L AT I ON S Y S T E M C OMP L I ANT ? Smoke Ventilation Systems are designed to facilitate the safe escape of occupants in the event of a fire. The automation of windows or vents for Smoke Ventilation is cost effective. By introducing automatic vents at high level that open upon detection of smoke, the smoke is allowed to escape to the atmosphere providing a clear escape route via increased visibility. SE Controls offers a comprehensive range of Smoke Heat and Exhaust ventilation systems suitable for any size and type of building. Beglin Woods Architects Beglin Woods Architects opened for business in1992. David Beglin and Simon Woods had practiced separately for over 15 years in Kenya before that. own sketches and made our own models, but we still produced dozens of well thought out, innovative and complex buildings in a year. Almost nothing was imported. Project Managers were unheard of. The architect designed, sourced and supervised most of the work. Now our staff look at old tracings and cannot believe how they were made. Looking back 400 years earlier, St. Paulâ&#x20AC;&#x2122;s Cathedral was drawn on linen with a quill pen and 400 years earlier than that there were no drawings at all. Office, Riverside offices have branches in 10â&#x20AC;&#x201C;15 different countries, and building components come from all over the world. International standards are now being developed to ensure compatibility with building components and materials so that almost everything fits together. Large-scale manufacturers of building components, large contractors and architectural firms are already coming to Kenya and will combine to produce buildings of the same scale as those in Singapore, China, the Middle East and United States. Apartments, near The Junction Sydney, and the design can be sent to Vietnam for an illustration and to China for a model. Project management is becoming stricter, and monitoring of deadlines and deliverables is becoming more vigilant, frequently involving penalties. The Cities and Towns around Nairobi are joining in the race for development. Soon Kisumu, Mombasa, Nyeri, Nanyuki and Isiolo will have projects as large and expansive as Nairobi. Office Development, Riverside Drive Technology Architecture has always been a contributor and an ally to technological development, and the future of architecture will grow exponentially with the developments in technology and finance. Taller residential buildings have to proliferate to ease the pressure on land prices. More sophisticated and economical building techniques must evolve. Builders must embrace the 24 hour day and the 365 day year. There will be more specialist subcontractors. The Present Work Environment As a Practice, we have lived through these vast technological changes over the last 23 years, and we have had to evolve and develop our skills accordingly. Emails are now expected to be answered instantly, when years ago it was accepted it would take several days to expect an answer from a letter. The range of building products continues to grow at an exponential rate, and information on anything is available instantly on the Internet, without having to go to a library. Clients now rarely proceed with a project unless they see several optional photorealistic renders of their project, and unless they see fully worked out financial returns on their investments, together with an array of priced options for services, materials and finishes. Watermark Business Park It is therefore tempting for architects to copy and paste their more successful designs from one site to another, but we have endeavoured to develop different styles of architecture over the years, and whilst we have watched with some amusement other firms copy some of our buildings, we remain committed to developing our ideas and styles, so that our clients can remain confident that they are receiving unique and ground breaking building designs from our firm. â&#x20AC;&#x2DC;There is much to celebrate!â&#x20AC;? A night view of Terminal 2. The project commenced in January 2014 and is complete awaiting hand over. Passenger Terminal Building at Isiolo Airport Phase 1 involved construction of a 1.4km long runway. This was completed and commissioned in Feb 2013 by H.E former president MwaiKibaki. Phase 2 works commenced in March 2013 and the scope includes: •	Construction of a passenger terminal building of approximately 5600m2 floor area with a capacity of about 700 passengers an hour . The facility when complete will handle both international and domestic departures and arrivals. to manufacture steel to international standards. Apex Steel makes Grade 500+ Deformed Bars - BS: 4449 at its technologically advanced manufacturing unit at Athi River. Every metre of the deformed bars bears the trademark, ‘APEX TMX’ that’s how customers know they are getting the genuine best steel. Bypass, Northern Bypass, Sondu-Miriu Dam, Kwale Base Titanium and Tsavo Transmission Lines. Across the border in Uganda, the bridge over the River Nile, the bypass expansion in Kampala, was made using Apex Steel. Engineering Africa... Over the last 40 years, Civicon Group Engineering has established itself as the regions leading Mechanical Engineering, Civil Engineering and Contracting ﬁrm in East and Central Africa. The company has a dynamic management team with over 30 engineers and technicians, a staff base of 2000, a large asset base of 5 fully equipped workshops across Eastern Africa and over 350 pieces of heavy equipment. The group also provides out-of gauge Logistics, Cranage and Erection services. louvered panels in all the shops. To further save energy, LED lights will also be used throughout the building. All light control systems will be centrally located, allowing regulation of lighting depending on specific requirements. Automatic sensor switches will be used in all washrooms to reduce energy wastage. In addition, any mechanical and AC equipment will only be used where necessary. This equipment will be nonCFC (chlorofluorocarbons) based. This has been informed by the fact that the release of chlorofluorocarbons (CFCs) from refrigeration equipment destroys ozone molecules in the atmosphere harming the earthâ&#x20AC;&#x2122;s natural shield from incoming ultraviolet radiation.Rain water harvesting is also a major feature in the overall design. biological waste water treatment system will be used to clean water to a non-potable standard for reuse. This will allow water recycling for use in toilets and irrigating the lawns. elements in secure surroundings. Key to the development is ample parking to ensure customer convenience is maintained from entry to exit. Lifts and escalators will be strategically provided in addition to access ramps on all levels to cater for the disabled. Back-up water and power will be availed by way of a borehole and stand-by generators respectively to allow for seamless operations. There will be a physical security barrier along the full perimeter of the premises coupled to prevent any unauthorized access. Accessing Riviera Mall Entry will be from an access road that is being constructed off Limuru Road to facilitate uninterrupted movement of traffic along the highway. This access will allow for through traffic from RundaKigwaru Estate, Karura bypass. Construction of the mall began in July 2014 and is expected to be complete mid this year. Project Team Project Manager: Barker & Barton Kenya Architects: Planning Systems Services Ltd. Quantity Surveyor: YMR Integrated Partnership Structural Engineer: Strana Consultants Ltd. Civil Engineer: Struvil Africa. Mechanical Engineers: Loadline Engineering Services. Electrical Engineers: Donn Consultants. Retail & Management Consultants: Knight Frank Kenya Ltd.
L-R, Bruno Pescheux, Arch. Daniel Manduku, Eng. James Mwangi and Eng. Reuben Kosgei are taken through a demonstration by Stella Ochola of Bamburi Concrete. Bamburi Cement, Innovation at its best! Eng. Reuben Kosgei (IEK Chairman), Bruno Pescheux (CEO) discuss the use of some of the apparatus inside the lab. Aggregate analysis – flakiness Index, Particle size distribution •	Testing of fresh concrete – workability, consistency and air content •	Testing of hardened concrete – density, compression strength of concrete cubes and non destructive tests on in situ structures •	Soil stabilization tests for road works – density measurements Customers will be able to know the quality and adequacy of their aggregates, sand and concrete mix designs. Users will additionally benefit from expert technical advice from Bamburi on concrete optimisation and best construction practices. Bamburi Cement advocates for the use of quality materials in construction for achievement of the best results. This new value added service to users of our products, is designed to provide quality testing and convenience to our customers. Building on Construction professionalism The latest innovation by Bamburi comes at a time when the country is experiencing rapid developments in the construction industry due to increased investment by government and private sector in infrastructure and housing. With this immense growth, there have been several challenges with building capacity and improving the level of professionalism in construction practices in Kenya. The construction sector in Kenya recorded a $235 million (Sh24.6 billion) loss in 2013 according to the National Construction Authority (NCA), which it blamed on low and poor quality workmanship. The Bamburi Mobile Concrete Laboratory augments Bamburi’s ongoing country wide initiative dubbed Builders Academy that has been offering free training to construction workers aimed at improving their skills, professionalism and safety in the building and construction industry. This is in line with its advocacy in improving construction and building standards in the country. Bamburi has trained over 200,000 masons over the last 13 years with an additional 1,600 masons trained across the country in 2015 alone. Bamburi Cement provides the WIDEST and most INNOVATIVE range of Cement and Concrete Solutions. The Bamburi Concrete technical team give a practical demonstration of the slump test, one of the services that will be provided by the lab. project managers, interior designers and technicians. and thus offers them exceptional services. vision and offering the same quality performance. of and in 1986 to 1995, the company delivered projects in Seychelles. architecture which is to the benefit of the clients. A number of factors have contributed to the growth and sustenance: •	Symbion aims to design with conviction, to the highest of standards, in a sustainable manner that provides both client and user with what they need, within a realistic budget and within a time scale agreeable to all. •	Symbion works with the best consultants across the regions they operate in and where certain expertise is lacking collaborate with construction professionals alike across the globe. Together the firm strives for excellence and endeavours to achieve it, in their creativity, professionalism and ethical obligations. •	Symbion is committed to a CSR policy that positively contributes to the local communities and environment of the respective countries, both ecologically and socially. develop a methodology inclusive of regular inspections and site supervision which strives to maintain an excellent standard of work produced and essentially the desired outcome once a project is complete. communities, communal memories and communal ambitions beyond the dimensions of individual buildings. Symbion believes architecture creates an opportunity to make life better. Symbion Group has grown from strength to strength through the years and has expanded its operations to more than fourteen countries across the continent, with more markets now opening up to those willing to explore. We congratulate Symbion Group on their 35 th anniversary. We are proud to be associated with you. MULTI-KONSULTS Ltd. Consulting Engineers & Technical Planners The Board of Directors, Management & Staff of Multi-Konsults Ltd are proud to be associated with Symbion Group as they mark 35 years of Design and Construction Services in Africa. Now in East Africa, KONE is one of the global leaders in the elevator, escalator and doors industry with more than a century of experience in delivering pioneering solutions. KONE’s comprehensive support ensures that planning and installation is as efficient and safe as possible, and that the equipment delivers top-class ride comfort from day one. “Congratulation Symbion Group, we are proud to be associated with you”. Electrical and Mechanical Contracting Engineers Plot No. 2527, Kiwatule Road, Ntinda P.O. Box 12536 Kampala - Uganda Tel: 0414286390, 0772698426 Fax: 0414-287167, Mob: 0712-691237 Email:ste ma@utonline.co.ug / enoch@stemaassociates.com. To advertise with us: Send Email to info@groupafricapublishing.com or contact your nearest agency for more information. At Genrec Engineering, our team is happy to discuss the value we can add to your projects with our resources, be that a single capability or the entire project offering. At Genrec Engineering, our values deliver your vision. We know that a company’s products are a reflection of the team that creates them. Our people are the underlying force driving the delivery of your vision with embedded values to deliver beyond our customers’ expectations.